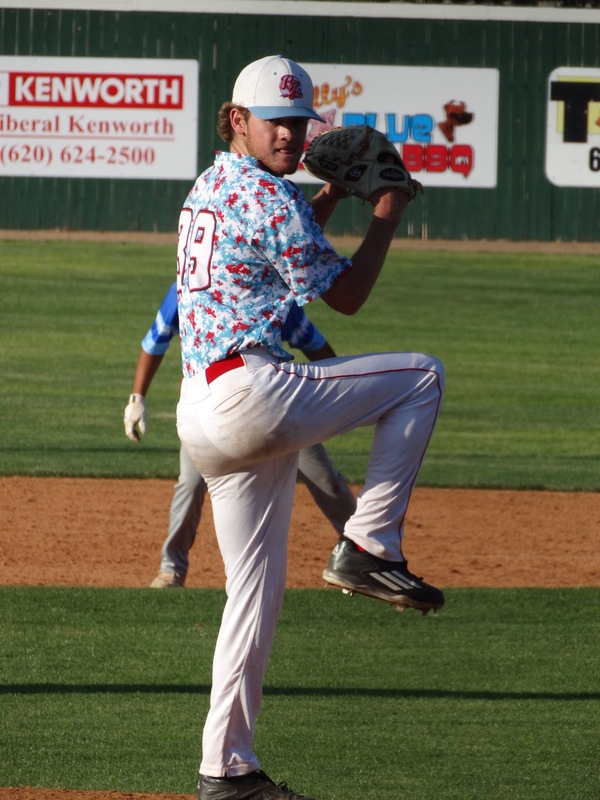 From 5 p.m. to 11:51 p.m, the Liberal Bee Jays and Haysville Aviators played 21 innings of baseball Saturday night at Brent Gould Field. Haysville won the first game 5-4 in 14 innings in a game scheduled for seven innings. The Bee Jays took the second game 12-4 for the split. In game one, the two teams played seven extra innings. Haysville’s Nate Stolze and Jack Cucinotta blasted homers in the first and fourth against starter Hayden Udall for early runs. Liberal scored two in the third thanks to a pair of Aviator errors. Brett Vosik provided an RBI single in that third which game the BJ’s a 2-1 lead until Cucinotta’s homer in the fourth to tie it. The Aviators took the lead 3-2 with a sixth inning run. Blake Brewster whistled a triple off the wall in left center to lead off the seventh. Dane Simon singled up the middle and through the drawn in infield to tie the game 3-3. Haysville scored again in the ninth to lead 4-3. Simon launched a homer to left to tie the game at 4-4. But the Bee Jays would not score again. Haysville scored in the 14th. Liberal struggled at the plate throughout the game. They stranded two runners on base in the eighth and three in the ninth which would have won the game. Liberal struck out 12 times. Hayden Udall pitched six strong innings with nine strikeouts and one walk allowing three runs. Anders Davidson went 1 and 1/3 allowing a run. Ryan Thomas worked 3 and 2/3 with five strikeouts, no walks, and no runs. Zac Bridger pitched the last three innings allowing one run with three strikeouts. Three Aviators and five BJ’s batted seven times. Liberal used four pitchers and Haysville used four. Haysville had three errors and the BJ’s did not have an error. Buoyed by the big win, Haysville scored two in the first in game two as Zachary Nogalski launched a homer against starter Brett Mathews. The Aviators added a run in the third for a 3-0 lead. Liberal and the leaky Aviator defense struck in the fifth. Brett Vosik singled home two in the innings after Daniel Abiles, Clint Allen, and Tom Lichty singled. An error at second allowed the Bee Jays to tie the game. An error on an attempted double play allowed two runs to score for a 5-3 lead. The Aviators scored in the fifth to make it 5-4. Liberal “blew” the game open in the seventh as strong winds belted out of the north due to storms north of Liberal. Lichty and Vosik provided RBI singles and Dylan Paul launched a three RBI triple to right center. Lichty’s single was a bunt on a squeeze play to give the BJ’s a 6-4 lead. The BJ’s walked three times and were beaned once in the inning. Liberal out-hit Haysville 10-4 and Hayville had two errors compared to Liberal’s one. Brett Mathews is 3-0 despite not having his best command. He went five innings with eight strikouts, four walks, and four runs. Bailey Cantu went two scoreless innings. Liberal is 11-6 in the Jayhawk and 13-7 overall as Haysville is 4-9 in the Jayhawk League. The series concludes Sunday afternoon at 1:30 at Brent Gould Field. Pre-game at 1:15 on 1270 and kscbnews.net. The game was pushed up due to the prediction of severe weather in the area Sunday night. Sharp McQueen PA and OBGYN and Associates are the buyout sponsors.